Trainee stewards Shannie and Onika Henry arrived at the training based in Cornwall in May to undergo 10 weeks of intensive training to transform them from civilians into Royal Navy sailors. The course culminated in the passing-out-parade, attended by families and friends. 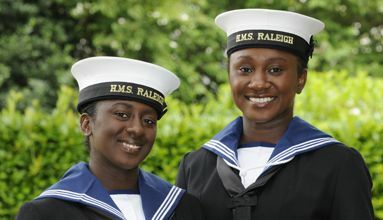 Both sisters joined the Royal Navy for the career opportunities and enjoyed the physical challenges within the course. With the first phase of their training complete, the sisters will transfer to the Defence Maritime Logistics School, which is also based at HMS Raleigh. There they will undergo a 12-week course to learn how to provide hospitality for visiting VIPs including Heads of State. They will also learn about accommodation management and stock accounting. The Royal Navyâs Initial Naval Training course is underpinned by nine Core Maritime Skills that are the foundations of naval life and underpin operational effectiveness. Recruits are taught the basics of naval discipline and customs. They learn about navigation and are given the chance to take the helm of their own medium-sized inflatable boat during a waterborne orienteering exercise. With Royal Navy personnel playing a vital role in Afghanistan and other land-based operations, recruits undergo training in basic combat skills, which includes survival in the field. Fitness is a key component of the training and is delivered using a disciplined method of military fitness which focuses on developing co-ordination and individual physical strength and endurance. As the course progresses, the recruits take part in three extended exercises to test their skills and understanding of the principles they have been taught. Details of career opportunities within the Royal Navy are available online at www.royalnavy.mod.uk or by calling the Recruitment Line on 08456 07 55 55.